This is a guest post from Elizabeth S. Craig, writing as Riley Adams. Elizabeth writes cozy mysteries, which I just love the idea of! Her latest is Finger Lickin' Dead. You can also listen/watch an interview about writing mysteries with Elizabeth here. It’s really no surprise that I’m drawn to small town settings. I grew up in a small town in South Carolina (that’s gotten a lot larger in recent years) and have always been interested in the dynamics inside the town. Small towns represent a lot of interesting contradictions. Maybe that’s part of the appeal. They’re not easy to read or label. Small towns are deceptively quiet. Of course a small town seems quiet. Go through any small town in the Southern US, for instance, and you’ll see evidence of a slower pace—like folks sitting on their front porches waving at cars going by. But there are many emotions bubbling under the surface. Feelings run deep in a small community because everything seems personal. These strong emotions lead to ample opportunity for genuine conflict on a very personal level. If you’re setting up real conflict in your novel (one that resonates with readers), a small town might be just the setting you’re looking for. It’s easy to find love triangles, long-standing feuds between families, passionate disagreements, and folks who might be bitter about imagined slights or jealous of the undeserving success of a neighbor. At the same time, there’s a fierce protectiveness among the townspeople and a “we take care of our own” mentality that can lead to insularity…and possible conflict with people from outside the town. Everyone knows everyone. There’s a comfort in knowing everyone around you, but it’s also a double-edged sword. You get an in-depth relationship with folks in your town, but you don’t often get the experience of meeting anyone new. This can lead to younger residents deciding to move away after they finish school—to meet someone to date, or to have more choice of jobs (and not having your boss be your neighbor…and cousin.) Wanting to move away from a hometown can lead to some inter-generational conflict. Small towns are friendly to newcomers, but have certain expectations for them. If you move to a small town, you’ll probably be greeted warmly. Neighbors will be happy to give you the scoop on the local schools or where to get the best produce, or who the best barber is. At the same time, there’s a certain expectation of the newcomer—that they toe the line and blend into the fabric of the town. If you’re the kind of newcomer who makes waves by suggesting better ways of running the PTA or the church Christmas play, or the 4th of July parade…then you’re not going to be very popular. A small town an easy setting for readers to picture and understand. If you throw in “small town” early in your novel, your reader will immediately have a ready-made picture in their heads of a slower-paced, friendly, gossipy, place. You don’t really have to work too hard if that’s what you’re interested in portraying. But if you want to twist it and show how cliquey, insular, and suspicious of change these towns can be, you can take your reader in a different direction. For murder mystery writers, small towns make for personal motives and a limited number of suspects. The motive for the murder will probably be extremely personal (love, revenge, hate), and your story will feature a limited number of suspects because the town itself won’t be very large. The small town itself might be a little isolated with the nearest town some distance away. This can add an extra dose of tension to your book. If there's a killer knocking out characters in this small community one by one, it can really heighten the urgency of solving the case. The odd juxtaposition of a bucolic setting and a violent death can invoke an urge to get everything back to normal and set things right. Whether the setting is a village in England or a small town in the American South, the reader feels the urge to solve the mystery and return the community to its former idyllic status. Do you enjoy reading or writing small town settings? What’s the appeal for you? Elizabeth’s latest book, Finger Lickin’ Dead was released June 7th. Elizabeth writes the Memphis Barbeque series for Penguin/Berkley (as Riley Adams), the Southern Quilting mysteries (2012) for Penguin/NAL, and the Myrtle Clover series for Midnight Ink. She blogs daily at Mystery Writing is Murder, which was named by Writer’s Digest as one of the 101 Best Websites for Writers for 2010 and 2011. I also favor small town settings in my fiction writing–no surprise, considering I grew up in the country. I’ve lived in suburbia for all of my adult life, but it’s not yet grabbed my imagination in the same way. Don’t know if that says more about the impressions made in childhood or about the elements inherent to a small town setting. Thanks so much for hosting me today, Joanna! My WIP is a small town, but the manuscript I’m planning will be set in San Antonio. Small towns are fun. I love small towns in books that I read. I feel like everything is that much more personal and it makes for a very emotionally invested read, which I love. I love visiting small towns because I can feel the warmth and also the scrutiny, but it just makes me want to show the people that I am indeed trustworthy and don’t have evil plans to upset their town. What a great post! My stories usually take place in small towns so I completely agree with what you’re saying. They’re a lot of fun, aren’t they? I really like the intimate feel of the small town setting. I too often write about small towns, and although they have certain features that are all their own, in many ways they are similar to suburbs (I live in one too!) except for being further away from large cities. The suburb where I live has a village hall and lots of local committees etc, and some people have lived all their lives in the same street. On the other hand, it’s probably easier for a stranger to settle down in my particular suburb than it would be in a small town, since there are more opportunities to have other interests across the city and people aren’t completely relying on their neighbours for company, entertainment etc. That’s sort of the way it is in my current town, which is a suburb of Charlotte, NC. Although we may participate in some of the small-town offerings here in my suburb (including the fantastic annual 4th of July parade), we’re all just as likely to hop in the car and pop off to Charlotte for restaurants, shows, etc. So….that part of it all isn’t as appealing to me as a mystery writer. I want all those folks stuck in the town together, getting on each others’ nerves! I couldn’t wait to graduate and go away to college. That being said, it’s ironic how the memories of living there creep into my writing. Thanks for a wonderful post. Ha! Yes, that’s a common question in small towns…and, actually, a common question in bigger Southern towns, too. I think it’s akin to, “Where did you go to school?” because whenever you say where you *do* go to church, the next question is: “OH~! So, you must know Jane Smith? And John Doe? Has John found a new job yet? I meant to run by there last week with some chicken casserole last week and plumb forgot…” It opens the flood gates! I love small town settings. 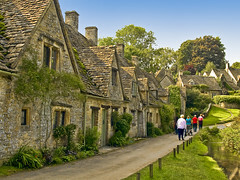 The picture looks like it might be from the Cotswolds. It does, doesn’t it? Bourton on the Water or something. Haven’t been there for 20 years, but it was gorgeous. Reading about small towns is almost a mini-vacation for me…especially when life gets hectic and complicated. I enjoy reading mysteries set in small towns, but I’m not fond of a series like the Murder She Wrote type. Those killed off just about everyone, it felt like. I think the problem is what is now called “The Cabot Cove Syndrome” (with a nod to “Murder, She Wrote!”)–how likely is it that there will be this much murder in a small town? And I’m sure small southern towns provide lots of quirky characters and options! Vivian–To me, small towns are where the action is! It’s so easy to be anonymous in cities, and that’s not what I’m looking for with my characters and settings–I want those characters in each others’ faces and business and causing trouble! 🙂 Love your idea of having a character escaping the “complicated” big city for the easy small town life. Ha! I met my husband when we were living in Zimbabwe and my parents used to send me an Australian police drama TV series called Blue Heelers. It was set in a small country town that seemed to be plagued with crime and disorder! My husband said that if we moved to Australia we were certainly not going to live anywhere like that regardless of how idyllic it looked! Fiona–Maybe that could be good character torture. 🙂 We writers are always so mean to our characters, but conflict sure does make the story better! Yes! This! I love writing in small towns, having grown up in one. What I think is most interesting is that even if suburbia overtakes a small town, as the metro area expands outward, it still can retain a lot of the small-town elements with the addition of tension with newcomers and the changes. It makes for a great dynamic. And small towns, to me, seem geared to books series because they create a recurring cast by their very nature. When I realized the two novels I had simmering in my brain could both be set in the same town — and actually fit together quite well — it made a huge difference for the richness of both stories. I’m having to push one off until the third or fourth book in the series, but it’s going to work much better that way.